Canonical may end up deciding that it chose the wrong day to unveil its Ubuntu tablet optimizations, because today has really belonged to the HTC One, but Canonical founder Mark Shuttleworth is pushing through anyway, and continuing the marketing blitz for Ubuntu mobile. After showing off the tablet optimizations, and re-evaluating the timetable for Ubuntu phones, Shuttleworth has come out saying that he thinks Ubuntu's mobile strategy could help the company become profitable, and that Ubuntu on tablets won't be as "jarring" as Windows 8 for users. Shuttleworth may just be in marketing mode, but he doesn't seem to like the path that Windows has taken. His big issue with the platform is the "stark transition" that users have to deal with between the traditional desktop mode in Windows 8 and the new Modern UI start screen, which is how Microsoft has optimized Windows for tablets. According to Shuttleworth, this transition is "jarring", and it's something you won't see with Ubuntu, because "indicators, things like network status and time, they don't jump around on screen, they stay in the same place" when you transition from phone to tablet to desktop. That's a really good point by Shuttleworth, but it doesn't really change the fact that Windows 8 has already surpassed the entire Linux ecosystem in PC install base, which automatically puts Ubuntu at a disadvantage as far as visibility. Ubuntu also doesn't have the built-in app ecosystem, and dedicated developers that Windows does, simply because of the size of the install base. But, Shuttleworth thinks that the mobile push could help to change that. In terms of visibility, Shuttleworth says that there are already a number of stores in China and India that display Ubuntu prominently alongside Windows, and when you combine that with the hardware partnerships that Canonical has built, the company may already be "over the hump" on its way to being profitable. And, even though Android and iOS are dominating the mobile landscape, Shuttleworth is confident that there's enough "volume that's achievable in mobile" to justify the push. first of all windows 8 has not passed the linux community in install count, have you heard of android and how many devices its installed on? Sorry, I wasn't referring to mobile. As per the February 1st numbers, all "Other" OSes had 2.1% of the PC market (this includes all flavors of Linux), while Windows 8 has 2.6% share. I'll edit the article to be more clear. I would definitely assume Ubuntu desktop users are being targeted. And, I know that being one of those Ubuntu users, I'm definitely excited to try out the mobile versions on my Nexus 4 and 7.
can google play apps work on ubuntu? or it has to be android? More than likely Android apps will be ported to Ubuntu, but there has been no indication that Android apps would run natively on Ubuntu. 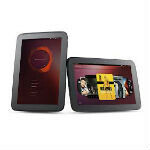 Android apps run through the Dalvik Java VM and Canonical has said that it won't be relying on Java for Ubuntu apps.